A lot of water has flowed under the bridge since the end of Cold War. The world has made tremendous advances. But, one place still remains unchanged and that is exactly the Korean peninsula. Needless to say about removal of the structure of Cold War,the Korean peninsula finds itself caught in the state of armistice and both belligerents level their guns at each other for more than half a century, making the Korean peninsula the most highly charged region in the world. The Democratic People’s Republic of Korea is a peace-loving nation. The DPRK, unlike the US, has neither invaded other nations with armed forces nor conducted any large-scale bilateral or multilateral joint military drills abroad against a third country. However in the last 70 years since its occupation of South Korea, the US has staged annually all kinds of aggressive war drills in the South and its vicinity against the DPRK, several thousand miles away from the US, thus driving the situation in the Korean peninsula and the region to the brink of war. It is well known that the US occupied South Korea under the guise of “liberator” following Japan’s defeat in World War II thus dividing Korea into North and South. From the early days of its illegal occupation of South Korea, the US has been desperate and impudent in portraying itself as a “defender” of the world peace and security while slandering the DPRK as a “criminal” destroying peace and security in order to mislead the world. In the last 70 years, the US has been clinging to ceaseless military build-up, new war provocations and drills against the DPRK with the strategy of maintaining tension on the Korean peninsula to isolate and stifle the DPRK and to interrupt the improvement of inter-Korean relations. 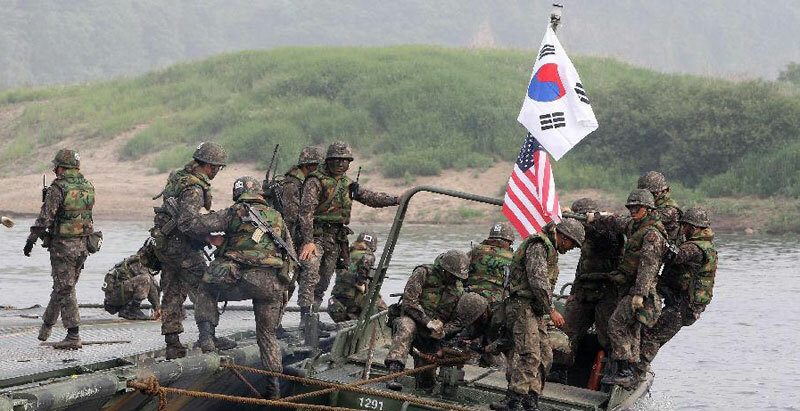 The joint military exercises annually staged by the US and south Korea on the Korean peninsula are quite different from military exercises of other countries in view of both frequency and purpose. The US-led RIMPAC naval joint military exercises, the world biggest one in the scale, is held every 2 years. In RIMPAC 2014, 23 countries, 47 vessels, 6 submarines and 200 aircrafts were involved, but the total number of troops was only 25,000. In case of Cobra Gold, the biggest annual joint military exercises in Asia, less than 10,000 troops from 28 countries are participating in the drill and the duration is around 10 days. However, the US and South Korea hold annually more than 40 joint military exercises such as Key Resolve, Foal Eagle, Ulji Freedom Guardian by mobilizing more than 500,000 US and south Korean troops and all means of war including nuclear-powered aircraft carrier, strategic bombers, nuclear-powered submarines and etc. The aggressive nature of the US-south Korea joint military exercises is also apparent in setting their targets like examination of feasibility of operations like “removal of the leadership”, “occupying Pyongyang”, “preemptive nuclear strike”, “decapitation raids” which can never be found in other countries’ joint military drills. It cannot be overlooked that the US is inviting military forces of the countries which took part in the Korean War like Britain, France, Australia, New Zealand, Canada, Denmark and Japan in the joint military exercises. The nuclear issue of the Korean Peninsula was originated from the ceaseless and increasing nuclear war provocations by the US and south Korea. Anyone who is not well aware of the reason, the background of the DPRK’s possession of nuclear weapons and the whole process of denuclearization of the Korean peninsula should clearly look at the reality and have a correct understanding. The Korean people have been exposed to the US nuclear threat since 1950. It has already been revealed that the US first introduced its nuclear weapon to South Korea in mid-August 1950, just after the outbreak of the Korean War. On November 30, 1950, the then US President Truman threatened openly to use atomic bombs in the Korean War front and instructed the US Strategic Air Force to be on standby to dispatch the strategic bombers at any moment to the Far East to drop atomic bombs. The US nuclear threat forced bitter separation among tens of thousands of families and relatives of the Korean people in the north and the south. The US nuclear threat against the DPRK further increased after the Korean War. All of the US three nuclear striking means have been mobilized without exception in all its notorious joint war drills. The special danger to be noted is that the US adopted the preemptive nuclear strike against the DPRK as its policy, long before the DPRK’s possession of nuclear weapons. On January 30, 2002, the Bush administration in its Union Address designated the DPRK as the “axis of evil” and in March 2002 announced its Nuclear Posture Review on which the DPRK was listed as the target of preemptive nuclear strike. In the US-South Korea Security Consultative Meeting in 2009, the US raised the level of nuclear umbrella in favor of South Korea. In other words, South Korea which had been in the level of “limited state of declaration” was upgraded to the level of more detailed “tailored deterrence strategy”, known as a strategy for a preemptive attack just as the same case when the US territory is attacked, thus paving a way to bring in more nuclear weapons at any time to South Korea. In its Quadrennial Defense Review Report in early March 2014, the US Defense Department defined the DPRK as the direct threat to the US and bellicose country and claimed that would win decisive victory through armed forces. In his memoirs, Leon Panetta, the former US Defense Secretary, revealed the fact that during his trip to Seoul in October 2011 he had conveyed the message from the US administration that it would use nuclear weapons if necessary. Peace and security on the Korean peninsula is of great importance to the Korean nation since it is directly related to the existence of the Korean nation and its reunification. Therefore, the DPRK has advanced broad and rational proposals aimed at removal of the danger of war, easing tension and providing a peaceful environment on the Korean peninsula and has made sincere efforts to their realization. The suspension of joint military exercises is the precondition for safeguarding the peace on the Korean peninsula. It is a long time since the Military Armistice Commission and the Neutral Nations Supervisory Commission controlling and supervising the Armistice Agreement of the Korean War disappeared on the Korean peninsula. The Korean People’s Army has already declared that the Armistice Agreement had been completely abolished by the US. It is inevitable that the cease-fire out of control will surely switch to a hot war at any moment. Emergency created in August last year clearly showed that even a trifling, incidental conflict between the north and the south may create a touch-and-go war situation and the current armistice devoid of power can no longer prevent a conflict and the danger of war. The DPRK has no intention at all to interfere in the US war games if they are really defensive and pose no threat to the DPRK and are conducted on the US territory or in the middle of Pacific Ocean. However, the DPRK cannot remain a passive onlooker at the fact that the US, the biggest nuclear weapon state in the world and the belligerent that is still at war with the DPRK, is conducting an aggressive and large-scale war exercises at the threshold of the DPRK by mobilizing all kinds of state-of-the-art strategic assets. If the US has no intention to invade or attack the DPRK, there is no need to stage the military war drills for such a long period with huge armed forces and preemptive striking means, more than enough to fight a full-scale war. Therefore, in January 2015, the DPRK advanced a proposal for the US suspension of joint military exercises in south Korea and its vicinity and the DPRK’s moratorium on the nuclear test and reiterated that proposal again in January this year. If the US is sincerely interested in the dialogue with the DPRK and the peace of the Korean peninsula, it should show its readiness to suspend joint military exercises. The DPRK considers that keeping the balance of force by bolstering the nuclear forces is the only way to effectively deter the US persistent nuclear threat and war provocations and to defend the sovereignty and the right to existence of the nation. The author Mr. Jon Min Dok, Director, Institute for Disarmament and Peace, DPRK. Why is Ssemuju trying to prove FDC critics right? Will Ugandans vote for a Donald Trump in 2021?